This BBC article sums it up for me. 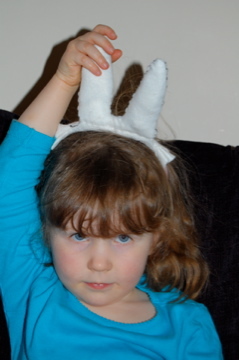 Last year I decided H would go as Miffy, I went up the road to our local Fabric Warehouse to buy some felt and made the most ridiculous pair of ears. They were terrible. The night before nursery Shaun then made the perfect pair of ears (stick them on cardboard, don’t pad them), we stuck H in a dress with the ears on a hairband and voila! Miffy! It worked, but it was stressful – and I’m sure that’s not what it’s meant to be about. Part of me wonders what the dressing up is really about. I mean, at this age we’ll stick our kids in something and find a book that fits unless we’re lucky – my Auntie bought H a Little Miss Naughty costume, but then I had a problem with whether nursery would allow it (as the n-word is banned there, for obvious reasons). As it happened, it was fine so that was H’s costume sorted – but that’s the thing – costume. Lordy. Where did all this spring from? What’s happened to having a book day where everyone takes in their favourite book instead? Had we not been able to do the Little Miss costume I had a fairy on standby, though I had no idea which fairy it actually would be. This all involves way too much thought and pre-planning for my liking. Next year she’s going as a first year at Malory Towers. Now THAT will be easy. Edited to add this Jack Dee link that Sonya found me – brilliant! So true, I can imagine getting a bit competitive too. As Mini D is only 13.8 months I’m rather grateful that he has a lot of royal blue clothes and we have bandages – Voila! Mr Bump! A book that I can say in all conscience I have read to him! so I don’t feel like too much of a lousy parent. Though I was tearing my bloody hair out at 6.00 when I realised that “Oh, it’s nursery tomorrow…shall I just *forget* about it?”.